Down the Rabbit Hole We Go...: A Craft That Even I Can Do! A Craft That Even I Can Do! I'm not a very crafty person, but I've enjoyed checking out some of the crafts on Pinterest and imagining that someday I might actually do them. About a month ago I decided to give one of them a try. Unfortunately, it didn't go as well as I thought it would, so it sat partially finished on top of my dining room hutch, waiting for either inspiration, or the hot, hot, heat of a Medicine Hat summer to finish melting the crayons. 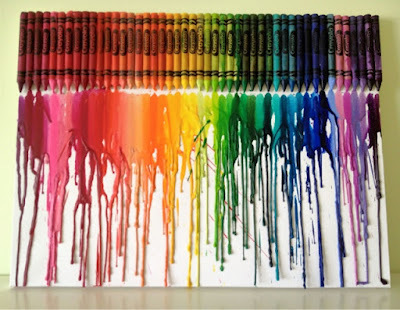 I originally used a blow dryer (which was suggested by multiple pinners) to melt the crayons, but it was taking forever and not doing a very good job of it, especially since the force of the blowing would speckle the wax across the canvas. Then this weekend my sister-in-law told me that my brother-in-law had done the project with their daughter using a heat gun. So this morning before heading out to work, my hubby dug his out of the garage for me. Success at last! I bought a $2 canvas from Dollarama and had an unopened box of 64 crayons in my desk (approx. $5) that I used. It didn't even use half of the crayons, although I did have to pull a couple of extra yellows from a small box of crayons, as there weren't enough in the 64 box. 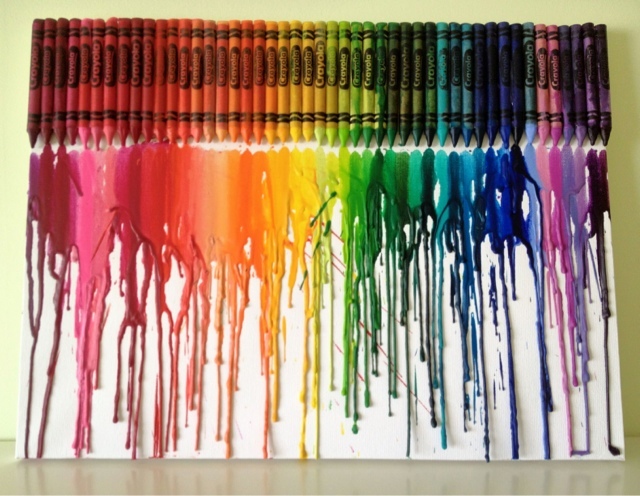 Once I had the colours arranged to my liking, I glue-gunned them on and then used the heat gun to melt the wax. Easy Peasy! That is too funny that you did this because I was thinking about doing it myself. I like the one too with the different greens and the tissue paper flowers. So cool. One of my favourite craft items is my heat gun, use it regularly when doing stuff with the kids.